A private jet rental offers you many different benefits that you simply can’t receive in first class. If you are a business professional who travels on a regular basis, you probably fly business class so that you can reach your destination without unneeded complications. Flying business class gives you access to a range of great benefits that make your flight as painless as possible. Business class does not let you enjoy the best flight experience. You might be surprised to learn the advantages you can get when renting a private jet and how cost effective they can be. There are multiple ways to rent a jet with some being way cheaper than you’d expect! Read the Private Jet Costs and Payment Options section to learn more. There are many reasons to fly private, but let’s start with why it’s a smarter choice than flying first class. BONUS: Purchasing a 25 hour Jet Card is a great way to cut down the cost of renting a private jet. Jets.com offers 2 hours free to make this option even more affordable. More than 5,000 airports actively operate in the US, and they are available for the use of the private planes. In contrast, commercial aircraft only have 500 airports. It is undoubtedly more convenient to land closer to your destination and avoid having to potentially take a lengthy cab ride. If you hate the numerous inconveniences that typically take place at the airport, you can choose to fly private to avoid security lines. You also do not have to think about getting to the airport very early or maintaining liquids under a specific allowance. Just show up, park your car near the plane, give your ID, and board. Even when you fly international, the process with customs is much smoother than with commercial flights. If you have ever flown commercially and you have to bring your work with you, it is hard to focus on what you are doing. Babies may cry, mothers may be lecturing their kid, or couples may be fighting behind you. The noise can easily distract you, and you end up not finishing what you need to do. Private jets will not give you this inconvenience. On top of wasting less time and moving faster than commercial flights, you can get your work done while in the air because you are alone or in similar company. Even in business or first class flights, it can be risky to carry out a classified transaction and conversation. You do not know who may be around and listening in. Additionally, a survey in 2009 by the National Business Aviation Association showed that the respondents rated themselves to be 20% more productive while they are on the company aircraft compared to staying in the office. They also estimated that they experience a 40% reduction in productivity when they fly commercial. When companies travel in groups, it may make sense to factor in the loss of work time, which can affect the business financially. Private jets are much faster. Let’s consider traveling to Fresno from Palm Springs, California, which should be under an hour in the air. Flying commercially, this trip can cost you seven hours when taking a commercial flight – considering the plane transfers, wait time, and the whole commute. Driving can even be faster since it may take just six hours. If you choose to rent a private jet for the trip, you can get to your destination within 45 minutes. Some destinations have no airline service or are limited for commercial flights, which makes a private jet much faster and more convenient than driving to the place. If your itinerary has multiple stops and you only have a short timeframe, it makes sense to fly on a private plane to save time and hassle. Most travelers dread going to airports because they don’t enjoy walking through airport security checkpoints. You need to arrive at the airport much sooner than your flight is set to depart to account for the time it takes to get through the security screening. Restrictions on what you can bring, including liquids, can be quite stressful. A boarding procedure that can waste a lot of your time. Private flyers love this means of traveling because they do not have to be concerned with airport difficulties. In fact, the ban on liquids that happened in 2006 did not affect those who take a private plane. You will not worry about traveling with items, such as product samples, sports gear, and the like. If you have a pet, you are welcome to take it with you in the cabin. But we associate private jets with the word “affordable,” primarily because they already suggest luxurious living. You lose out on the cost of the flight due to having to cancel the flight. You need to book a last-minute flight that you did not expect to take. Missing a meeting with a new client due to a flight delay can be expensive in more ways than one. You may think private planes are just an option for big players in the industry. Even small companies can benefit from them as they become a more affordable method for traveling. You can save more with private jets when you consider a day out of the office compared to two days in a hotel room. With the benefits you can get out of chartering a private jet, flying private is more than just about comfort. It has real advantages that can even help you spend less while flying in luxury than with an airline. Most people board the plane and hope the flight attendants serve food that is at least edible and you are stuck with limited options. Most people who have ever traveled experience this reality. When you book a charter jet, you can choose any meal you want. Meal flexibility is among the top private jet amenities you could hope to enjoy during your travels. You will let the crew know what you would like to eat during your flight, and they will honor your request. Another tremendous benefit of using a private jet is that you can leave when you want. You will have to leave on the airline’s schedule. Get up very early in the morning to catch your flight. Leave hours before your flight in order to beat traffic. Take into account the amount of time to go through security & park your car. Book days, weeks, months in advance to get a better price. Private jet charter defeats that roadblock and lets you decide when to depart. But bag checks can soon be a thing of the past. That is if you choose to fly on a private jet. Private jets let you keep your bags and all of your belongings in sight for the duration of the flight. You won’t need to worry about lost luggage or wait for your bags at the end of your trip. There are many ways you can rent a private jet. How frequently you will need it. Whether you will need a jet one time. Your need it for a series of flights. The cost savings from travelling year round. Depending on your needs, there’s an option for you. If you regularly travel for business? Take a look at 25 hour jet cards. Want to travel lavishly to Vegas without it costing all your gambling money? You’ll want to find a last-minute flight on a jet that you can fill with your friends. You’ll want to look into a private jet membership. Want to have more ownership of the plane? Fractional jet ownership is your best option. This is the most standard option. Chartering private jets is quite similar to booking a commercial flight. Just select your departure and arrival cities, dates, preferred take off and landing time, and the number of passengers and you’ll get a broker to find the cheapest options for you. A Jet Card is a prepaid card, bought in 25-hour increments, that is redeemed to book a flight on one of our private aircrafts with as little as 24-hour notice. It’s a simplified and cost-effective way to experience our safe and luxurious private travel. If owning a jet doesn’t make sense for you, but you still fly often, Jet cards and fractional jet ownership are your best options. For individuals that already own a jet, you may still need a jet card handy if your jet doesn’t go far enough or hold enough passengers. It can also come in handy if you’re traveling with your jet, but the family needs to meet up with you. Fly frequently, but don’t want to deal with the headache or maintenance of owning your own jet? Private jet membership or fractional jet ownership are your best options. Memberships can include perks on food, hotel stays, retail, and more. If you’re considering a membership, you’ll want to be very careful as there are many horror stories of inexperienced private jet companies or start-ups failing and members losing all the money they put into it before ever getting to board a jet. By far the most cost-effective way to travel on a private jet is by booking last minute with a group that can rent the whole plane. Booking this way can get you prices that would shock you. Not everyone has the luxury of last minute travel, but if it is an option for you, give us a call within a few days from when you want to depart and we can let you know what deals are going on. Fractional jet ownership is a way to own or lease a private where each owner is responsible for the cost to purchase, maintain and operate the jet. Going this route does guarantee access to a certain amount of hours or days with the jet or fleet of jets, but does have its limitations. This tends to be one of the more expensive ways to travel in a private jet, and you lose the convenience and flexibility that jet cards and one-time charter. Oh and if the value of the jet significantly diminishes when you go to sell back your share, you can lose more money than you planned. Another difference between choosing first class and chartering a private jet is that while first class is about the airline, flying on a private jet is about you. When you charter a private jet, you will be able to fly whenever and wherever you desire in privacy that is designed to meet your specific needs. You can select from a range of different private jets to charter from our private jet comparison catalog. Here are some comparisons to help you to understand the different types of private jets that we offer and which one might be best suited for your purposes. If you have a small group with whom you will be traveling, one of our light jets may be the right choice for you. Light jets are terrific choices for comfortable short- to mid-range distances. These jets are able to fly further and faster than other types of non-jet aircraft. Baggage capacities that range from 53 cubic feet to 77 cubic feet. The average flight range that you can expect from a light private jet charter is between 2.9 and 3.6 hours. The most common flight speed of these jets ranges from 476 to 518 mph, which means that you can enjoy a non-stop flight range of around 1,500 miles. With their smaller sizes, light jets may take off from private airfields as well as airports. Mid-size jets are ideal for you if you want to enjoy a longer range and more headroom. Our mid-size jets are a little wider and taller than our light jets, allowing you a little more room to stretch out. The average seating capacity of our mid-size jets is eight passengers. The baggage capacity ranges from 48.0 cubic feet up to 90.0 cubic feet. The flight speed ranges from 422 to 541 miles per hour. The greater flight range means that it is possible to fly nonstop from coast to coast on a mid-sized jet or to only have to make a single stop for fuel. Super jets are great choices for you if you will be traveling with more passengers and when you want to fly further. These jets offer enough headroom for people to stand up inside of the cabin and also have private lavatories. Our selection of super jets offers more room and greater seating capacities. The average seating capacity on our super jets is nine passengers. The super jets also offer much greater baggage capacities that range from 82 cubic feet up to 150 cubic feet. The flight speeds range from 455 mph to 605 mph. Our heavy private jets are perfect for you if you plan to travel with a small crowd. These jets are ideal for traveling overseas in luxury for your intercontinental flight. Our heavy jets can carry up to 16 passengers. Baggage capacities that range from 127 cubic feet up to 240 cubic feet. You will enjoy a much greater flight range with our heavy jets. These jets offer an average flight range from more than six to more than 10 hours, depending on the model that you choose. The flight speeds of our heavy jets range from 480 miles per hour to 551 miles per hour. During your flight, you can enjoy food and drinks from the galley and freely move about the plane. We also offer some turboprop jets for private charter. Turboprop jets may be good choices for business executives who want to charter a private jet for short- to mid-range flights. They are particularly good choices for you if you plan to travel to a remote location or need to complete short-hop trips. 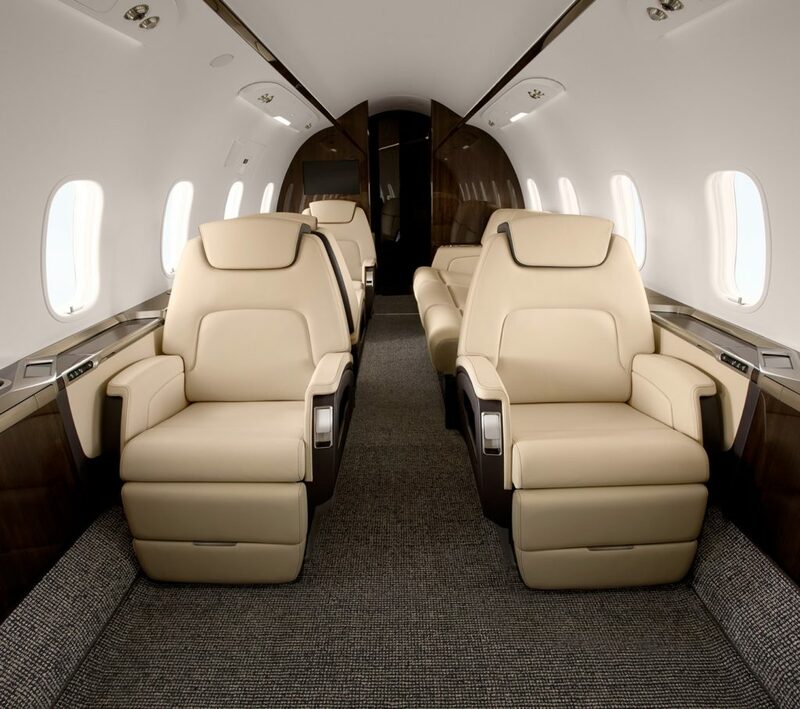 These jets offer seating capacities that range from six to nine passengers. The baggage capacities range from 40 cubic feet to 71.3 cubic feet. With our turboprop jets, you can enjoy a flight range of 3 to 4 hours. Flight speed of 322 to 360 miles per hour. These jets are more economical to fly than light jets and do not need as great of runway distances to come to complete stops, making them ideal for you if you fly to areas that do not have commercial airport facilities available. We now live in an age where it’s virtually impossible to travel without getting on a plane. With over 5,000 aircraft in the air at any given point in time, it’s undeniable that the aviation industry continues to grow. Rising numbers, however, means busy airports, overbooked flights, and hours sat crammed into a middle seat on a noisy flight. It’s during these moments that most of us think about what it would be like to upgrade to a private jet, flying comfortably with just the people we’re traveling with. This might not actually be such a bad idea. Flying private isn’t as unattainable as most people think it is. Most jets are chartered for business trips, rather than owned by a billionaire to fly to a private island. This is only one of the misconceptions shrouding the private jet industry. One of the most inaccurate, however, is that flying private is less safe than taking a commercial flight. In fact, private jets are just as safe, if not safer than flying commercial – especially in light of recent controversies that have occurred on many commercial flights. Keep reading to learn more about why you should consider a safe, comfortable flight on a private jet. The misconception that flying private is more dangerous than flying commercial is due in large part to how widely publicized incidents on private jets are. Since the passengers on board private jets are often public figures, the media is inclined to sensationalize the event in order to gain attention. Although there are different ways to compare statistics, more passenger fatalities have actually occurred on commercial flights than on charter and private jets in the last 15 years. Of course, you should always do the appropriate research on any jet company before boarding. Many actually have much more rigorous safety standards, which we’ll talk about in greater detail later. At the end of the day, flying is still the safest way to travel, regardless of whether the flight is commercial or private. The feeling of lining up to board a flight and wondering how all these people can possible fit onto the plane. The sheer number of people flying on the average commercial aircraft on a daily basis is not only uncomfortable but can actually pose a safety hazard. Cash-starved airlines are encouraged to fly as many passengers on as many flights as possible to maximize their profits. Each flight puts stress on the plane’s structural integrity. The temptation to cut corners on safety measures may rise for overworked crewmembers. By contrast, getting a maximum number of passengers onto the plane is not the focus when flying private. Since the price of the journey does not hinge on how many seats are filled, safety can be emphasized and all proper steps carried out. The lower overall passenger volume also means less wear and tear on the place, making for a safer journey. This is not to say that safety is not important to commercial flights. However, higher numbers always increase the odds of mistakes. As mentioned before, private jets often undergo more rigorous safety testing than commercial flights. Reputable companies will use third-party organizations specialized in safety to evaluate the safety of their organization. The metrics and methods for evaluating the businesses are incredibly strict, meaning that companies that receive the stamp of approval are extremely safe. For example, Jets.com adheres to Assure Safety Standards, ensuring that passengers receive the best in both pilots and aircraft. Assure standards ensure that all jets and pilots exceed the rigorous FAR 135 safety standards, which include drug and alcohol testing, flight crew time and rest requirements, pilot record disclosure, and more. All aircraft are also either ARGUS Certified or Wyvern Registered, two of the most respected and recognized symbols of quality and safety in the Aviation business. Furthermore, Jets.com’s Chief Safety Officer has over 30 years of experience. Many of us have experienced the inconvenience of a canceled or delayed flight due to inclement weather. Even more serious, some of us may have had to endure a frightening journey or make an emergency landing because of extreme weather. Interestingly, private jets are better equipped to deal with bad weather. Because they have the ability to land at more airports than commercial flights, private jets can change plans very quickly. This means that if the weather gets too rough to fly in, a private jet can make a quick landing rather than put passengers through scary conditions. Some jets even have the ability to fly above weather at up to 51,000 feet. Of course, a good pilot will never take unnecessary risks just to get to a destination on time. But with the ability to avoid this factor, private jets look even more desirable. One of the greatest appeals of flying on a private jet is cutting down on the miserable time spent walking through the airport and waiting for hundreds of people to board and exit. Not only do private jets offer the opportunity to get on and off the plane faster, they often actually fly faster. The fastest passenger planes in the sky are actually private, often flying nearing the speed of sound. Jets can fly above weather, cutting down on time spent navigating rough air. The ability to land at more and smaller airports also cuts down on total travel time. Instead of landing at a major airport and taking a cab or public transportation to the actual destination, private jets can land at smaller, local airports and offer passengers door to door service. Flying private is only a luxury if you are safe. As commercial flight prices continue to rise without increasing their safety standards, flying in a private jet seems less unrealistic. Regardless of whether you’re looking to impress clients or go on vacation, safety should always be the number one concern. Flying without fear is certainly worth an investment. Travelling can be a great experience, especially when you use one of our terrific private jets to get there. But there will be occasions where you will have to fly commercially, find a place to stay last minute or find someplace to eat where you have never been before. We spoke with travel experts to identify the best tips for you to get the most out of your travel experience as well as save some money along the way. Not – how do I save a few hundred dollars on flights, and then a little more on my hotel, but are these savings worth it? There is no sense booking a flight that takes you to an airport 50 miles from where you want to be, because it’s cheaper, and spending the money you have saved on transport once you get there. Hotels and flights are cheaper during low season or shoulder season. For example, hotels in the Caribbean cost less in the summer and fall than they do during winter or spring break and European hotels are less expensive in the winter than in the summer. Even if using miles and points, there is usually more availability during this time. I usually prefer shoulder season for the best combination of lower prices and good weather. If you travel in low/shoulder season you have a better chance of booking a luxury hotel. status which unlocks room upgrades, early/late check out, free breakfast, free business lounge access, priority check-in etc. While travelers spend hours and hours prior to reserving hotels in order to find the best price available, once they book, they forget about their reservations till the date of travel. Prices tend to drop 42% of the time AFTER hotels are booked and can drop up to 72% off the total reservation amount! Pruvo is a free, automatic web service that tracks price drops for existing hotel reservations and notifies the customer once we detect a better price for the exact same hotel room. Purchasing discounted hotel gift cards through gift cards sites like Raise.com. Routinely the site offers gift cards with discounts of 4-5% at places like the Four Seasons , Hotels.com or Ritz Carlton properties Purchasing gift cards When the site has a sale adds 4% savings and is the easiest way to save money. Use credit cards to earn points to pay for hotels. Frequent flier points from credit card sign-up bonuses and spending fund a large percentage of my trips. I received two million plus points in sign-up bonuses alone and traveled to places like Aruba for less than $1,500. I recently stayed at the Park Hyatt Zanzibar using a combination of points plus money to secure a room for about $114 and earned points at the same time. A recent stay at Radisson Blu in Kigali, Rwanda before my gorilla safari was gratis by using points during my visit. Being flexible on where you stay permits me to optimize my savings. In Cities like Washington, DC or New York City, I find each visit another hotel has a fantastic deal. I pick among the top hotels based on price. It’s also fun trying new sites. Janice Lintz, Travel Writer who has traveled to 116/193 UN countries and 160/327 Traveler’s Century Club destinations and is writing a book about traveling the world on points. Sometimes you may save $1000 by just splitting one hotel reservation into several parts. Because hotels have different daily rates, a different combination of the same nights may cost you much less. you’ll pay less for food. Virtuoso Agents have access to luxury hotels that provide amenities like free breakfast, food & beverage credit, etc. Otherwise, I like to use Hotel Tonight to find luxury boutique hotels. In London, I prefer the Charlotte Street Hotel and Rosewood London – both bespoke luxury. Luxury travel brands have loyal followings and we all tend to advertise and promote special offers to people who follow us. Sign up to your favourite brands on Instagram and Facebook and sign up to their newsletter. It’s where you’ll find the best deals. Just ask. It’s always worth asking when booking if there’s anything the representative can do. You might find you get a small discount, or something extra thrown in. Don’t ask once you’ve booked – make sure it’s before! I prefer to hire private guides or use small group tours like Context Travel. If you are keen to really save money look at Airbnb Experiences. Go to local markets, buy local brands, make an effort to avoid Starbucks and any international brands, and look to go where the locals go. Prices are usually cheaper for local brands and you get a great experience out of it too. If you’re staying in a Kid & Coe property, you can always ask the host what they recommend, and where the best value family eateries are. Having a local insider is a great way to find out these things. I find that if my room includes breakfast, the buffet usually carries me through the day. I find it impossible to eat a big meal and then sit down to a multi-course lunch as well. Ordering lots of small plates at dinner are fun and is cost effective. Most people tend to want to experience many flavors rather than eat huge portions. I find I eat significantly less when I sample rather than when I order an appetizer, entree, and dessert. Book the fancy restaurant for lunch instead of dinner if you want to save money on eating out. It’s just like cable, and you need to unbundle the trip. You tend to overpay when you don’t know what the cost of each component. Providers can add fat, and I like to trim it. The easiest way to reduce costs is to understand what each item costs. The African safari companies intentionally try to overcomplicate the trips when in reality, going on a safari shouldn’t be more challenging to plan. I insist on knowing what I am paying and tend to book the activities online myself to save money. I find it is the same amount of work and the savings add up since I travel so extensively. PASS also offers lounges for $50 worldwide. For all of these, you don’t need membership in any airline or government program. Chartering a private jet for your flight needs can allow you the ultimate convenience and luxury. You will be able to fly whenever you want and to your chosen destination without having to fly at times that are chosen for you by a commercial airline. Private jets allow you to enjoy much greater privacy than flying first class can offer. To learn more about the features of our luxurious private jets, you can review our private jet catalog and our private jet comparisons pages. Once you have narrowed down your choices, enter your charter flight details in our jet charter quote form or call us at 1-833-538-7266 (833-JETSCOM) to discover how much it costs to charter a plane.